Dr. Ronald L. Numbers is the Hilldale Professor of History of Science & Medicine, University of Wisconsin-Madison. Despite growing evidence to the contrary, evolutionists in the late twentieth and early twenty-first centuries clung to the belief that creationism could be geographically contained. In 2000 the usually reliable American paleontologist and anti-creationist Stephen Jay Gould, assured foreign audiences that creationism was not contagious. “As insidious as it may seem, at least it's not a worldwide movement,” he said reassuringly. “I hope everyone realizes the extent to which this is a local, indigenous, American bizarrity.” Although Gould remained oblivious to it, the worldwide growth of creationism by 2000 had already proven him utterly wrong. Antievolutionism had become a global phenomenon, as readily exportable as hip-hop and blue jeans. In the past few decades it has quietly spread from America throughout the world and from evangelical Protestantism to Catholicism, Eastern Orthodoxy, Orthodox Judaism, and, especially, Islam. 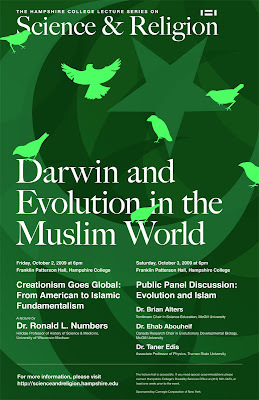 This lecture situates the Islamic embrace of creationism in the larger global story. If you are in the area, we hope you can join us. A video will also be available a few weeks after the event. For videos of past lectures, please visit our lecture series website. Looks very, very interesting! Will video or audio be available?